Elegant Findings Antiques has an extensive selection of over two hundred pieces of antique china from many famous antique china companies like Herend, Pirkenhammer, Delft, Lenox and Pickard. 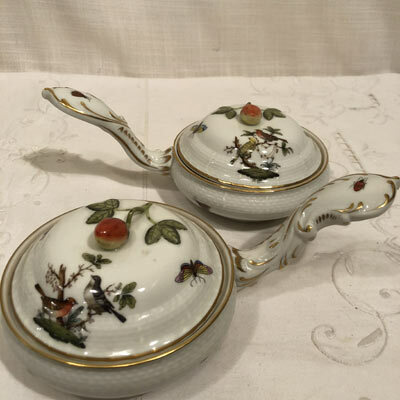 We have a large selection of antique Lenox and Lenox Belleek china from 1900 to 1930s. 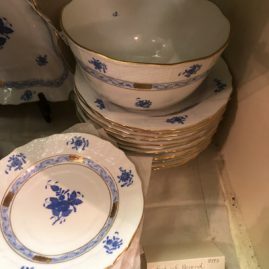 We also have a great variety of Herend china like Rothschild Bird, Queen Victoria and Chinese Bouquet. Our selection of antique china is selected for its rarity, fine condition and fabulous quality. We have a wonderful selection of Lenox silver overlay porcelain with either a cream or cobalt background. We have tea and coffee sets,sugar and creamers and tea caddies. All of these silver overlay items are from 1900 to 1930s, and they are very hard to find. We also have beautiful antique Lenox fish plates, ship plates and orchid plates painted by the famous Lenox artist Morley. 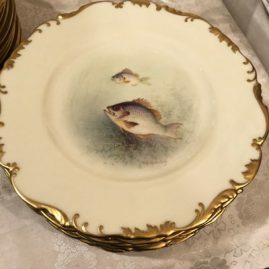 Each plate is painted differently. They are museum quality and works of art. 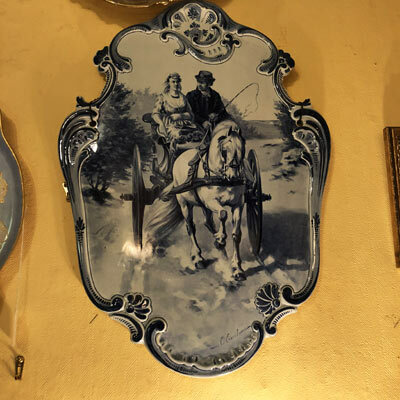 We also have some beautiful antique Delft plaques. 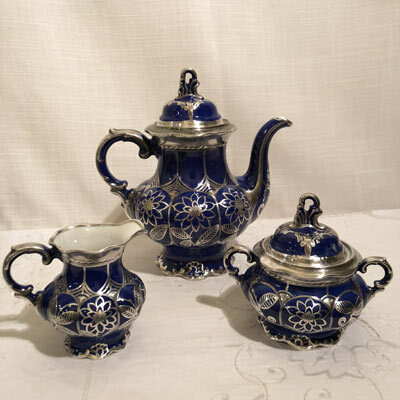 We always search for beautiful Delft pieces. 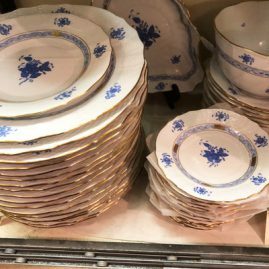 We have just acquired a large dinner service of blue Chinese bouquet Herend china for sixteen. 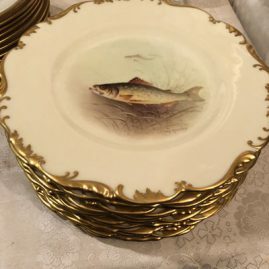 It consists of 17 service plates, 16 luncheon plates and 16 bread plates, as well as a triangular serving bowl, a round serving bowl, an oval serving bowl and a square serving bowl. 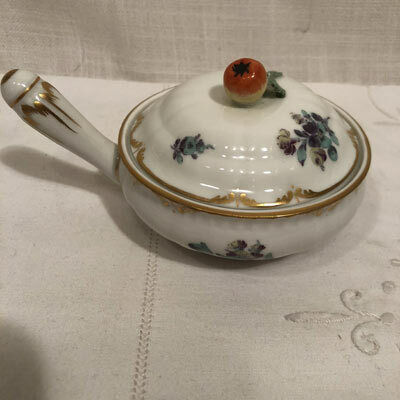 We also have Herend Chinese bouquet in the rust color including a large tureen with a lemon top, a pair of three arm candlelabra, a coffee pot and a sugar and creamer. Please look at the photo gallery below to see some of our fabulous porcelain selections. Click on any picture below to see an enlarged picture. 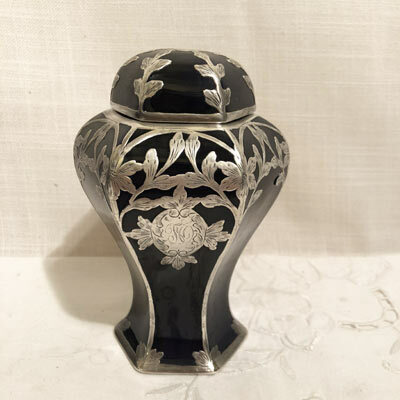 Please call or email us at Elegant Findings Antiques with any questions you may have. 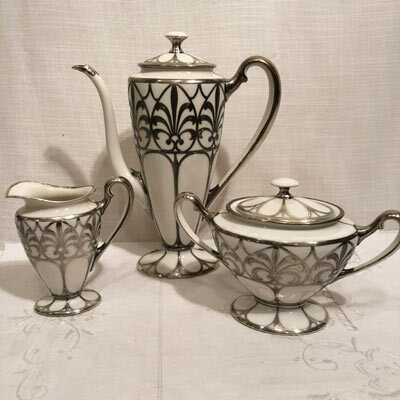 Ceramic Art Company of Lenox Belleek silver overlay tea set. It is from 1896 to 1906. It is really beautifully done. The teapot is 5 1/2 inches tall by 8 1/2 inches wide. The covered sugar is 4 1/4 inches tall by 5 1/2 inches wide. 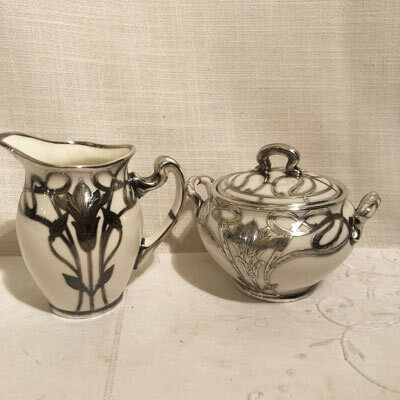 The creamer is 2 3/4 inches tall by 4 3/4 inches wide. Price on Request. Ceramic Art Company of Lenox Belleek silver overlay sugar and creamer. It is from 1896 to 1906. The covered sugar is 5 1/2 inches tall by 8 1/2 inches wide. The creamer is 4 1/2 inches wide. Price on Request. 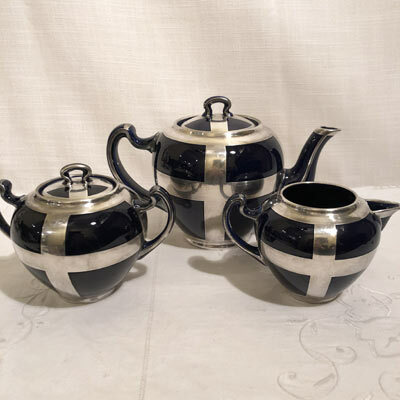 Lenox cobalt silver overlay tea and coffee set. circa-1900 to 1930. The coffee pot is 9 1/2 inches tall by 8 inches wide. 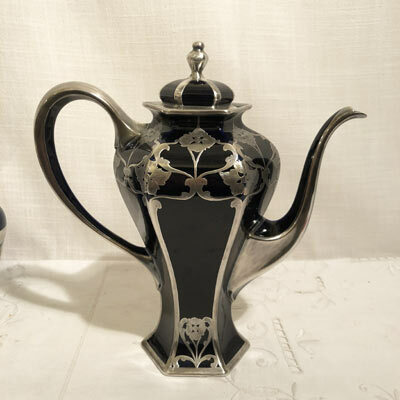 The teapot is 6 3/4 inches tall by 9 3/4 inches wide. the covered sugar is 5 1/4 inches tall by 6 1/4 inches wide. The creamer is 4 inches tall by 5 inches wide. Beautiful silver overlay set. Price on Request. 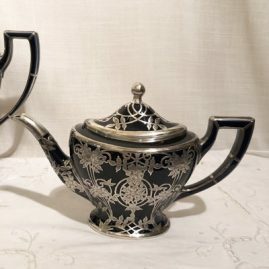 This is a close up of the teapot from the previous silver overlay set. Priced with complete set. Art deco cobalt silver overlay Lenox set. This set includes a teapot, sugar and creamer from 1900 to 1930. It has a green Lenox mark. The teapot is 6 3/4 inches tall by 9 5/8 inches wide. The sugar is 5 inches tall by 6 1/2 inches wide. The creamer is 4 inches tall by 6 inches wide. Price on Request. 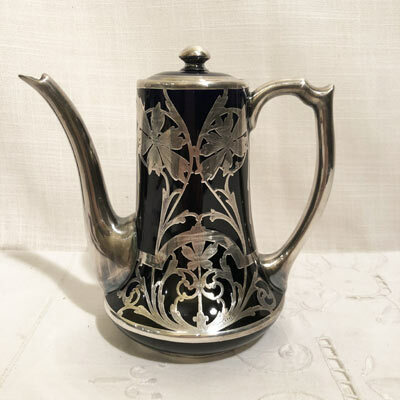 Lenox silver overlay coffee or teapot with beautiful silver overlay flowers. It is 7 1/4 inches tall by 7 inches wide. Circa-1900 to 1930. Price on Request. Lenox silver overlay teapot from 1900 to 1930.. Height is 6 1/2 inches, width is 9 inches and depth is 6 inches. Price on Request. 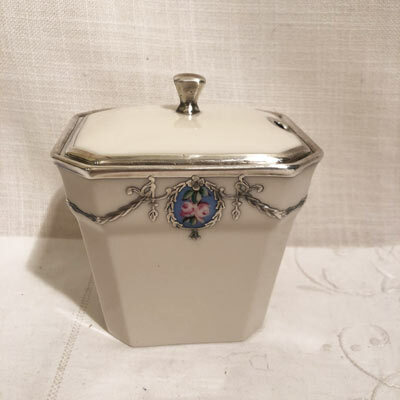 Rare cobalt silver overlay tea caddy. Height is 5 3/4 inches and the width is 4 1/4 inches. Price on Request. Cobalt Lenox silver overlay coffee pot. It is from 1900 to 1930.. It is 10 inches tall by 9 1/2 inches wide. Price on Request. 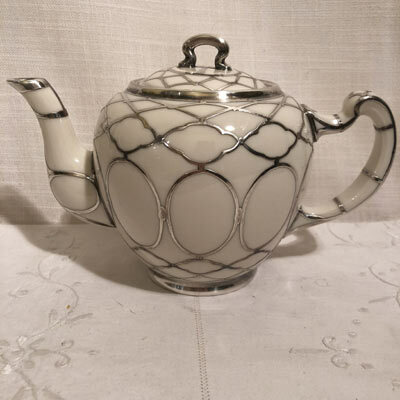 Rare Lenox silver overlay cobalt teapot. On one side, with the silver overlay chains, it is monogrammed BSS 1905. 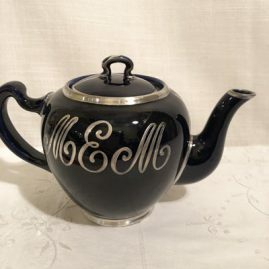 On the other side, it is monogrammed MEM. Width is 10 inches and height is 7 inches. Price on Request. On one side, with the silver overlay chains, it is monogrammed BSS 1905. On the other side, it is monogrammed MEM. Width is 10 inches and height is 7 inches. Price on Request. 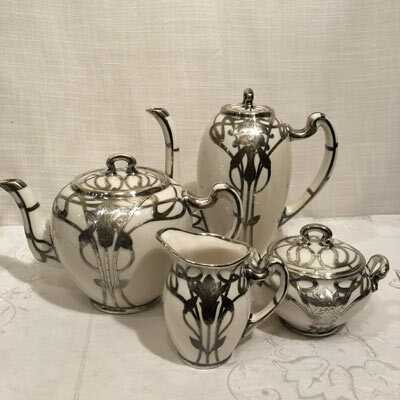 Hutchenreuther Bavarian silver overlay three piece tea or coffee set from 1939. 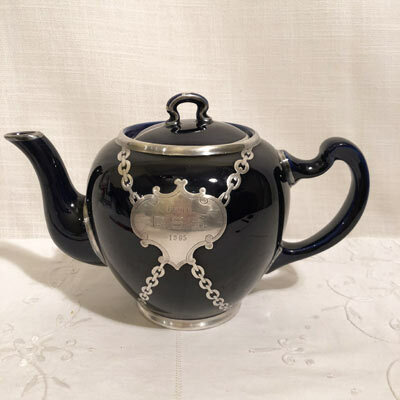 Teapot is 9 inches tall and 8 inches wide. Sugar is 5 1/2 inches tall by 6 inches wide and the creamer is 4 inches tall by 4 3/4 inches wide. Price on Request. 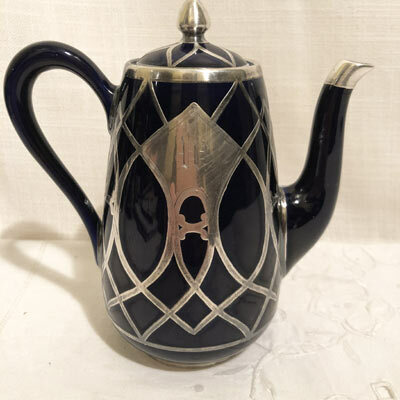 Cobalt silver overlay tea or coffee pot. One side has a W monogram on it. It is from 1900 to 1930. The height is 6 1/2 inches and the width is 6 inches. Price on Request. 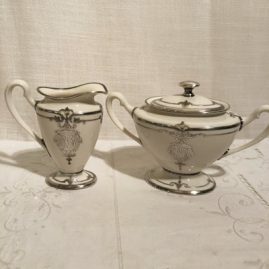 Green mark Lenox silver overlay sugar and creamer. Circa-1900-1930. The covered sugar is 4 1/2 inches tall by 5 inches wide. The creamer is 4 1/2 inches tall by 4 inches wide. Price on Request. 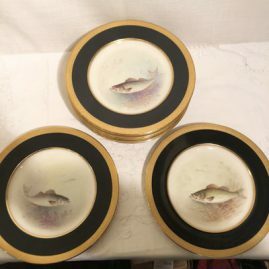 Set of eleven fish plates artist signed by famous Lenox artist W. H.Morley, each painted with different fish. These have museum quality painting. Circa-100-1930. Diameter 9 1/4 inches. Price on Request. 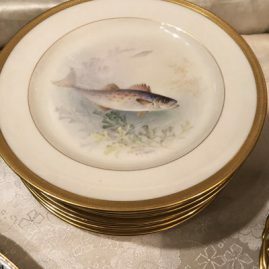 Close up of one of the eleven Lenox artist signed W. H. Morley fish plates. Circa-100-1930. Diameter 9 1/4 inches. Price on Request. 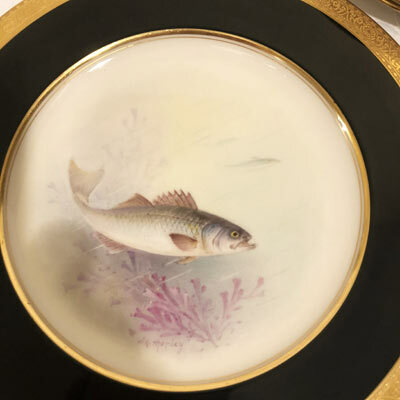 Wonderful set of twelve green mark Lenox fish plates, all painted differently. The fish plates are artist signed by the famous Lenox artist, W. H. Morley. They have museum quality painting and fluted edges. Diameter is 9 1/2 inches. Price on Request. 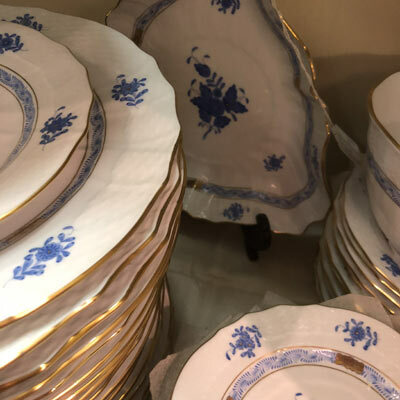 Herend Chinese bouquet dinner service for sixteen in blue and white. 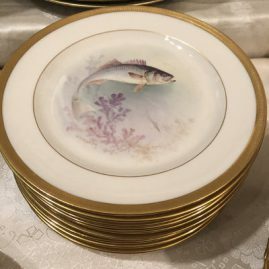 This dinner service includes 17 service plates, 16 dessert or luncheon plates and 16 bread plates as well as many serving pieces. Price on Request. 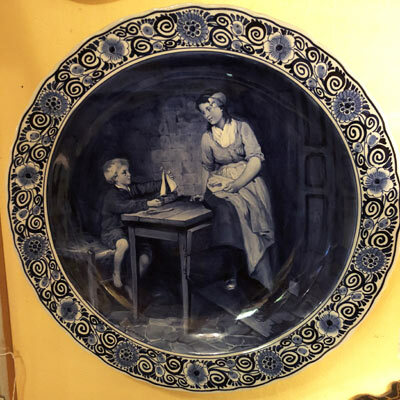 Large round Royal Delft plaque after Bloomers. circa-1911. Diameter-16 inches. Price on Request. Wonderful Delft Plaque after Erdmann. impressed Joost, Thoolft and Labouchere, 1890-1913. It is 22 inches long by 15 inches wide. Price on Request. Lenox silver overlay tea and coffee set. 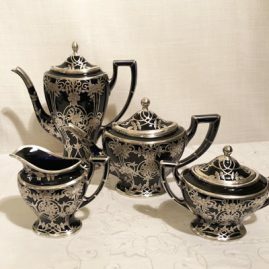 The set includes a tea pot, 7 inches tall by 9 1/2 inches wide, a coffee pot, 8 inches tall by 8 1/2 inches wide, a covered sugar,-4 inches tall by 5 inches wide, and a creamer that is 4 1/4 inches tall. Circa 1900-1920. Price on Request. 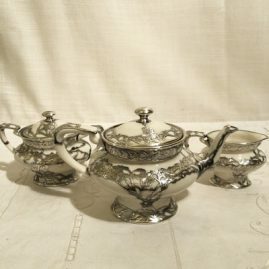 Lenox silver overlay coffee set. It includes a coffee or tea pot, a covered sugar and a creamer. The coffee pot is 10 inches tall by 8 1/2 inches wide, the sugar is 8 1/2 inches wide by 5 1/2 inches tall and the creamer is 5 inches tall. Circa-1920s. Price on Request. 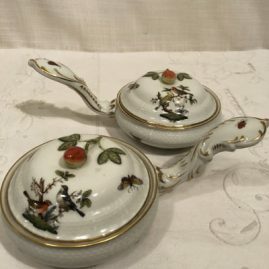 Set of six rare Rothschild bird Herend pot de cremes with wonderful handles and fruit tops. Circa-1920s. each pot de creme is 8 3/8 inches long and diameter of bowl is 4 1/2 inches. Price on Request. Nymphenburg pot de creme, one of a set of twelve. Circa-1930s-1940s. they are 5 inches long and 2 1/2 inches tall. Each has a fruit finial. Price on request. 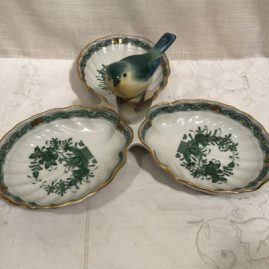 Green Herend Chinese butterfly three section bowl with figure of a bird on top. Length is 12 inches. Price on Request.